Numerous stone pavilions stood towering in the Divine Seal Sect’s trading area in the Realm of Maelstrom, where the middle Void domain Meng Li oversaw matters year-round. Since Nie Tian had decided to stay in the Realm of Maelstrom for the time being, Duan Shihu and Jing Rou stayed as well. However, the two of them didn’t just sit around and wait. Instead, they either dug into the art of seal wielding, or investigated Xing Bo’s collusion with the Bonebrutes through various resources. As Nie Tian expressed his intention to build a teleportation portal in the Divine Seal Sect’s stronghold in the Realm of Maelstrom that led to the Domain of the Falling Stars, Jing Rou agreed without hesitation. She did it because Nie Tian was not only Duan Shihu’s junior martial brother, but also a Son of the Stars. She even assigned a five-story stone pavilion to Nie Tian, where Zhao Shanling would be able to build the teleportation portal. As the most special trading center throughout the entire Domain of Heaven Python, the Realm of Maelstrom held all sorts of spiritual materials. It would be easy to gathered all the necessary materials here. Meanwhile, Zhao Shanling already had numerous materials of this kind in stock. He would only need to get ahold of some subsidiary materials with the Divine Seal Sect’s help, and he would be good to go. The establishment of a teleportation portal that connected the Realm of Split Void and the Realm of Maelstrom wasn’t important at all to the Divine Seal Sect. In the eyes of Meng Li and others, the Domain of the Falling Stars was only a remote, weak domain, where even entering the Void domain was extremely difficult. It was only natural that they didn’t attach importance to such a domain. However, for all of the sects in the Domain of the Falling Stars, it was of great importance that they had a teleportation portal through which they could visit the Domain of Heaven Python. The establishment of such a teleportation portal would mean that Qi warriors from the Domain of the Falling Stars would be able to travel to and from a domain that was much more advanced than theirs. Furthermore, since the other side of the teleportation portal was in the Realm of Maelstrom, Qi warriors from the Domain of the Falling Stars would be able to directly communicate and trade treasures with outsiders and Ancientbeasts. They would probably be able to find all of the rare treasures they needed to enter the Void domain in the Realm of Maelstrom. Since the teleportation portal Zhao Shanling was building would allow people to travel across the boundless starry river, it would take a long time to build. During this time, Nie Tian didn’t pay attention to any of the transactions that happened all the time in the Realm of Maelstrom, but instead focused on practicing cultivation. In the cultivation room in the stone pavilion the Divine Seal Sect had assigned for him, he refined his spiritual core and three vortexes of different powers with spiritual materials of different attributes, and made significant progress. The sky in the Realm of Maelstrom was like the mouth of a well, through which people could see no suns or moons, but only dotted stars. As he practiced cultivation in this place, the Nine Stars Flower that was rooted in his vortex of star power channeled star power from the heavens unceasingly, and grew slowly. He had long since recovered his ten drops of Blood Essence, and his bloodline aura had fallen dormant again, waiting for the awakening of his next bloodline talent. Nie Tian was so indulged in cultivation that he didn’t notice it at all. A loud clamor suddenly woke him from his cultivation. Then, he walked out of his cultivation room. He left the building and followed the clamor to a square that was paved with cyan stones and surrounded by stone pavilions. In the square stood many people, including Meng Li from the Divine Seal Sect and Du Zheng From the Thousandsword Mountain Sect, as well as Zhong Shishu and the old woman named Wu Yun from the Golden Vast Sect. As the representatives of the Divine Seal Sect, the Thousandsword Mountain Sect, and the Golden Vast Sect in the Realm of Maelstrom, Meng Li, Du Zheng, and Wu Yun were all at the middle Void domain. Every one of them had a grim expression. Du Zheng and Wu Yun nodded slightly, not attaching much importance to Nie Tian. They didn’t know Nie Tian’s status as a Son of the Stars. After a moment of silence, Jing Rou said, “Xing Bo’s connection to the Bonebrutes has been proved. We caught him and a few members of his clan red-handed while they were meeting up with Bonebrutes on a dead star. However, Xing Bo and Xing Lifeng escaped our blockade with the Bonebrutes’ help. “Xing Lifeng is a middle Void domain expert from the Xing Clan, which is one of the Thousandsword Mountain Sect’s subordinate clans. With a cold face, Du Zheng from the Thousandsword Mountain Sect said, “If Xing Beichen hadn’t summoned Ke Jinpeng and four others to a remote region in the starry river and disappeared since, Xing Bo and Xing Beichen wouldn’t have been able to escape from us. “Our sect wasn’t aware of the Xing Clan’s secret actions. Now that we’ve learned that they actually colluded with the Bonebrutes and provided them with a large number of human corpses for them to build burial grounds, it’s our duty to root them out. Xing Bo and Xing Beichen were both chosen ones of the Thousandsword Mountain Sect, and the two of them had ranked rather high among all of the Thousandsword Mountain Sect’s chosen ones. After losing Ke Jinpeng and four other Void domain experts, the Thousandsword Mountain Sect’s overall strength had suffered greatly. Now, Xing Bo, their most valued chosen one, had gotten into a scandal. All of this made Du Zheng very angry and edgy. The Thousandsword Mountain Sect’s strength would shrink further, and the Xing Clan would die out. At the same time, Xing Bo’s collusion with the Bonebrutes also made the Golden Vast Sect, which had away sided with the Thousandsword Mountain Sect, very unhappy. It was only right that the Thousandsword Mountain Sect atone for what had been done. Du Zheng made it perfectly clear that their sect had nothing to do with this incident, and showed their determination to root out the Xing Clan, yet he was rather ambiguous about hunting down Xing Bo and Xing Lifeng. With a frustrated tone, Du Zheng said, “Those two traitors will go to the Shatter Battlefield. We all know how dangerous and complicated that place is. Since too many messy matters have happened in our sect recently, we don’t really have the energy or the ability to march disciples into the Shatter Battlefield to kill those two. With these words, Du Zheng turned around and left without sparing Nie Tian a glance. He had learned that the Domain of the Falling Stars was a domain with only nine realms. Besides, it wasn’t rich in cultivation resources, and had produced only one Void domain expert so far. In Du Zheng’s eyes, the value of the Domain of the Falling Stars was very limited. He didn’t think that seizing a few realms of it would give a noticeable boost to their sect’s withered strength. Wu Yun gasped with astonishment. Before Zhong Shishu could say anything, she gave him a hard look, then took him and left in a hurried manner. Zhao Shanling suddenly flew over from behind a stone pavilion. After assuming a foothold beside Meng Li, he said with his eyes filled with arrogance, “I’ve fulfilled the mission. The teleportation portal I built successfully teleported me to the Realm of Split Void and back.” Even facing a middle Void domain expert, who enjoyed a lofty position in the Divine Seal Sect, he didn’t seem servile in the slightest. “I also destroyed the spatial rift in the Realm of Split Void that lead to that burial ground of the Bonebrutes. “From now on, no Bonebrutes or Qi warriors from the Domain of Heaven Python will be able to travel to or from the Domain of the Falling Stars through the spatial rift in that burial ground anymore. He had destroyed the spatial rift that connected the Void Illusion Mountain Range and that burial ground of the Bonebrutes without notifying the Divine Seal Sect first. He had done it to eliminate the possibility of Thousandsword Mountain Sect and Golden Vast Sect disciples entering the Domain of the Falling Stars. He hadn’t learned about Golden Vast Sect and Thousandsword Mountain Sect’s decision to keep their hands off the Domain of the Falling Stars until his return. This proved that this person actually cared a great deal about the Domain of the Falling Stars. He didn’t care about the attitude of the Golden Vast Sect, the Thousandsword Mountain Sect, or even the Divine Seal Sect when it came to the safety of the Domain of the Falling Stars. Among the experts who had come on this trip with Nie Tian, Qi Bailu was the mild one, Hua Mu was the experienced and far-seeing one, and Zhao Shanling was the arrogant and unruly one. He had been a pain in the neck for all of the major sects when he had been in the Domain of the Falling Stars. He had acted without any scruples. Everything he had done had been in his interest, and he had rarely taken others’ feelings into consideration. Who would have thought he still adopted the same style now that he was in the Domain of Heaven Python? Meng Li from the Divine Seal Sect was inwardly displeased after hearing that he had destroyed the spatial rift that led to the Domain of the Falling Stars without consulting the Divine Seal Sect first. Even though they had promised to take no land from it after learning about Nie Tian’s identity as a Son of the Stars, they had announced that they would go explore it. However, Zhao Shanling’s actions had placed them in an awkward position. With these words, he flew skywards and disappeared into one of the numerous unknown spatial rifts in the water curtain. “This person acted just as unruly in the Domain of the Falling Stars, didn’t he?” Jing Rou asked softly. Nie Tian nodded and smiled bitterly. “It appears so,” Nie Tian said. He knew that Zhao Shanling had gained Master Voidspirit’s legacies from that space disruption zone. Thanks to that, he might have already gathered all of the materials he needed to break through into the Void domain. At this moment, sharp sounds came from a green jade bracelet on Jing Rou’s milky white wrist. A shudder ran through Nie Tian. Li Shimin was one of the greatest emperors in Chinese history. However, when he was young, he killed countless enemies in battle. He also killed two of his brothers during the Incident of Xuanwu Gate. He often had nightmares, in which the ghosts of those who had died because of him would drag him down into the hell. He told this to Qin Shubao and Yuchi Jingde, two brave generals who had served him for a long time. Therefore, Qin and Yuchi decided to guard Li Shimin's bedroom at night, so that no one could ever hurt the emperor in his sleeps. After that, Li Shimin never had nightmares any more. 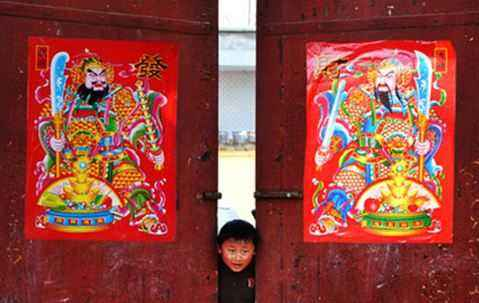 Since then, Qin Shubao and Yuchi Jingde became Door Gods in Chinese folk culture.